After your 4.5 hour flight from Boston, join Travel Honey for personalized trips to the Azores! Nine volcanic islands in the Atlantic Ocean with lush nature, spectacular vistas, a mild climate and vibrant Portuguese culture. A Travel Honey Trip to the Azores is much more than a package, it’s a bespoke toolkit that allows you to explore the Azores like an expert. WHY TRAVEL HONEY TRIPS TO THE AZORES? Choose your own adventure: after a one-on-one planning call, we’ll create a personalized guide and interactive map. We’re Azores experts: we’ll make sure you maximize your experience and visit the must sees and hidden gems during your trip. Everything is vetted: we’ve tested all accommodations, restaurants, activities, rental car companies, and recommend only the best. WHY A TRIP TO THE AZORES? The Azores islands are best known for geothermal wonders such as volcanic lakes, geysers, black sand beaches and hot springs. There are lots of outdoor activities including hiking, biking, kayaking, climbing, paragliding, whale watching and golfing. On your trip to the Azores, you’ll also enjoy museums, historic villages, festivals, sustainable farm tours and cooking classes. WHAT’S INCLUDED IN TRAVEL HONEY TRIPS TO THE AZORES? 7 nights of luxury accommodations on São Miguel with breakfast. Rental car for 7 days.  A personalized day-by-day itinerary for your trip to the Azores.  An extensive guide divided by region.  An Interactive Google Map with everything from guide and itinerary. Two 30 minute pre-trip calls with the Travel Honey team.  Choice of 3 curated experiences (more can be added).  1 yoga class.  Gift bag of local goodies. HOW DO TRAVEL HONEY TRIPS TO THE AZORES WORK? Rates start at €2,500 per person and €3,000 per couple (for one bedroom in the off season). After booking, we’ll schedule a 30 minute call to give an overview of the island and answer questions about our trips to the Azores. On the call, we’ll also learn your travel preferences, so we can match you with the best accommodation and create a personalized day-by-day itinerary with activity and restaurant suggestions. Your choice of accommodation and activities are based on availability, so book early, especially in the summer! 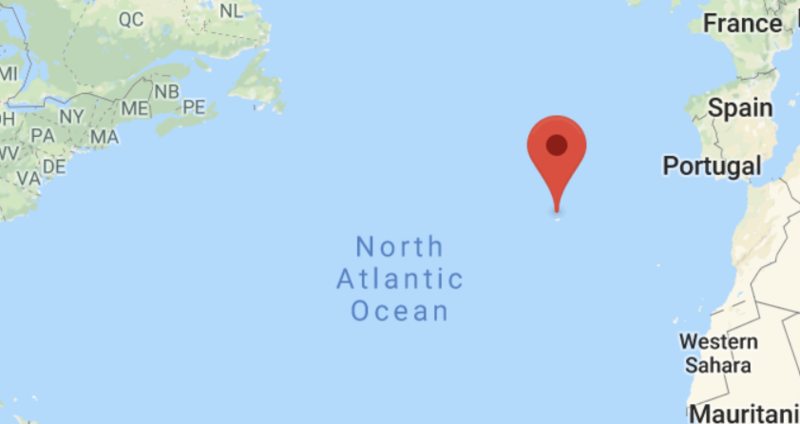 Where exactly are the Azores? It’s about 2400 miles (4.5 hours) from Boston and about 900 miles to Portugal (2 hours). What airline do I fly and how do I book the flight? Delta offers direct flights from JFK from May 23 – September 6. Azores Airlines flies direct from Boston. Azores Airlines also flies direct to Toronto and Providence, Montreal and Oakland in the summer months. The Azores Airlines offers a free stopover to Europe. Click here for more information on Azores flights and the free stopover. Azores Airlines is currently not affiliated with another airline or alliance, but it has a business class and has just leased 6 new planes. We recommend booking directly with Azores Airlines and you should choose Azores > PDL as your “To” location. The average cost for flights in the off season (Nov-April) is $600-$700 roundtrip, but they can reach $1000 in the peak summer months (in the summer, you can save by booking early and being flexible with your dates). The flight to São Miguel from the east coast is 4.5 -5.5 hours and typically leaves in the evening and arrives early the next morning. The flight home is 5.5-6 hours and typically leaves between 3-6pm and arrives about 1.5 hours later with the time change. The flight arrives early in the morning, do you recommend booking a room for the night you arrive? Yes, most check-in are not until 3pm, and most flights arrive at 6am (when it is usually still dark). We highly suggest taking a nap to rejuvenate yourselves before starting your day! Average monthly temperatures. Source: www.holiday-weather.com. What time of year is best to visit? The islands enjoy a Gulf Stream climate where daily highs range between the 50sF and 70sF all year round. So there is never a wrong time to go, it just depends on your preferences. But whenever you go, be prepared for all types of weather and for it to change quickly! Average monthly rain fall (in millimeters) and days it rains per month. Source: www.holiday-weather.com. If you want to sun bathe on the beach, July and August are your best bet but June and September are a close second. You can also get occasional beach days in April/May/October. Because of the humidity, when it’s sunny, the real feel is higher than the listed temps. If you want to avoid crowds, skip July and August and even June and September are getting busy. You can hike all year round and the cooler months are great time to enjoy hot springs. Sao Miguel is green and lush so be prepared every day for it to rain, but it’s typically brief, so you can still get outside. And if you do get a bad day, you can explore Ponta Delgada or hit the hot springs! Our Regional Guide includes links to the best weather websites for the islands and a webcam app, so you will know where the weather is best on the island. Can I go shorter or longer than seven nights? Of course, just let us know! How are the guides for this trip different than the itineraries on your website? The itineraries on the Travel Honey website are from trips from actual travelers. The guides for the Travel Honey Trips to the Azores are from months of research on São Miguel. The regional guide is an extensive list of sights and restaurants for each region and the personalized itinerary is our suggestion of the best seven days for you based on your travel style. Want Travel Honey to handle ALL the details? Check out our Travel Honey Luxury Concierge. What type of car will I get? Included in the Travel Honey Trips to the Azores package is what’s similar to an economy car in the United States. For example, a Toyota Yaris. Please contact us if you would like to upgrade, but just note that we recommend a smaller car because Ponta Delgada and towns around the island have narrow roads. What type of accommodation is included? The listed price is for 7 nights of luxury one-bedroom hotel accommodations with breakfasts. Accommodation in vetted villas/apartments available upon request (they may or may not include breakfast). Contact us for pricing if you’d like an additional bedroom (for yourself or if you’d like to share lodging with a group). What is the cancellation policy? A full refund is available anytime before 30 days from the date of departure. For cancellations 30 days or less from the date of departure, we are unable to refund any amount because of the cancellation policies of our vendors. We recommend purchasing trip insurance to protect against cancellations within 30 days or less. We recommend Allianz Travel, Travelex and Travel Guard. Do most people speak English? Yes, especially in Ponta Delgada and those involved with tourist activities. If you venture into the smaller towns, you’ll still find some, especially older folks, who don’t speak English. What is the currency? The Euro! You can read many more money and spending tips in the Travel Honey Regional Guide. How do I get around? Are roads clearly marked? The island is about 10 miles wide and 40 miles long, and there are major roads going to most of the must see sights. Because there is very little public transportation, we’ve included a rental car in the package, so that you don’t have to rely on taxis and tours. You’ll have the freedom to explore the island and get off the beaten path. The roads are clearly marked and Google Map is largely accurate. 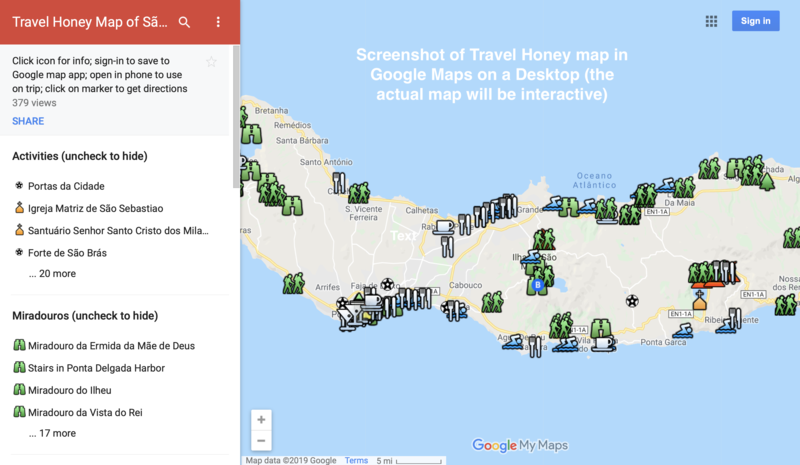 Plus, you’ll have the amazing Travel Honey map! How expensive is food and drink? Food and drink, especially wine and beer, is more affordable than in the U.S. At the fanciest restaurants, you’ll likely spend between $75-$100 per couple for dinner, including wine. But we’ll also recommend some amazing local favorites that are significantly less. Other questions about São Miguel? Your Travel Honey guide will include all the must sees and off the beaten path gems. It also includes tips on what to pack, the weather (including the best weather website), hiking, how to use your cell phone abroad, and many more. You’ll also have two 30 minutes calls, for any other questions about Sao Miguel or Travel Honey Trips to the Azores! What about the legal stuff? Please read the Travel Honey Trips Booking Terms & Conditions.